When Rover doesn’t get the run of the house, a reliable gate is as good as gold. But this new design by Fusion Gate comes in pink for Breast Cancer Awareness Month. Part of the American Pet Products Association (APPA), Fusion is partnering with The Pink Fund to offer a special, limited-edition art screen. It’s called Songbirds in Pink ($299) and is intended to support women battling breast cancer. Throughout October, the company will donate $20 for every fusiongates.com purchase, with an additional $10 being donated for every Songbirds screen sale. In an effort to make the lives of those suffering from breast cancer more manageable, The Pink Fund helps pay for their basic living expenses. “Research has shown pets are good for health and in many cases help lift the spirits of those battling disease and illnesses, so it is fitting that many in our industry have decided to recognize awareness campaigns such as this,” said APPA President and CEO Bob Vetere. Buying a Fusion Gate for your pet means that you get a lightweight yet durable divider that has a one-of-a-kind finial latch system, a low threshold for safer passing through, and a reversible locking system that pets can’t outsmart. We recently gave the gate a glowing review! Plus, having one in your home means someone else will benefit when they need it most. 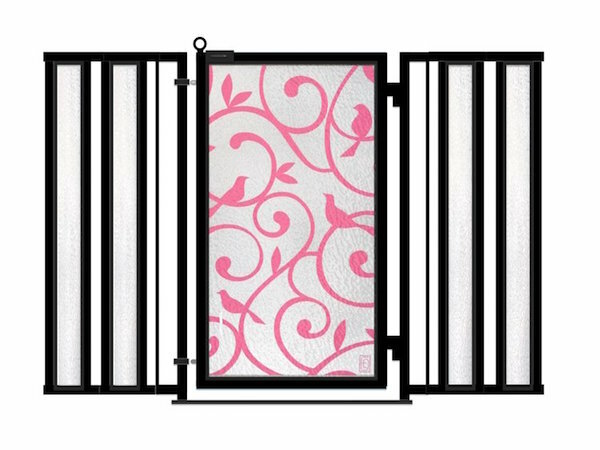 The post We Love Fusion’s Songbirds in Pink Pet Gate Screen for The Pink Fund appeared first on Dogster.